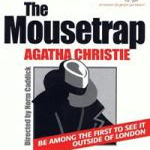 The only mystery about The Mousetrap is that it is still playing after 59 years and over 24,000 performances. It’s a museum piece of a murder mystery plot line, and now shows its wrinkles compared to the modern stage equivalents or the many Miss Marples and Hercule Poirots seen on the ABC of late. Nonetheless, the Arts Theatre was completely booked out on the Tuesday night I was there, and for the entire season. Indeed, the Therry Dramatic Society has laid on extra nights. This is the first time that the play has been produced by either amateurs or professionals outside its London home, and while the audience at the final applause is asked not to reveal the identity of the killer, this seems to be code for also not revealing how soporifically boring the play is. Critics present at the very first productions in 1952 were equally underwhelmed. Director Norman Caddick does an excellent job with the material. Set in Nick Spottiswoode’s lovingly created Monkswell Manor complete with roaring fire within and falling snow without, Caddick gets all his players bar none to drum up superbly eccentric characterisations and accents - and has them exchange dialogue with aplomb. Alicia Zorkovic and Stephen Bills play the hosts of the manor with the nervousness of newlyweds and novices in the guest house game. Oliver de Rohan's performance is as impressive as his hair and he’ll have no problem with an acting career after his upcoming stint at the Bristol Old Vic Theatre School (UK). Lindy LeCornu’s Mrs Boyle is annoyingly realistic and Nigel Starck’s major is similarly officious. Allison Scharber gave a less fathomable Miss Casewell. Philip Lineton does an odd but fetching Italian and gets the most puzzling lines. Lee Cook ably orchestrates the action as the uninvited detective on skis. It’s easy for me in hindsight to tell you that I correctly guessed who the murderer was – Agatha Christie gives you so many clues. It’s not the butler.